Despite the ultimately exciting method of victory, and the novelty of having a Cypriot club in the final eight of the European Cup, the APOEL v Lyon game was actually a dull spectacle. This was true in both technical and tactical terms. Technically, the sides finished with fairly low pass completion rates (71% and 74%), and tactically neither changed much throughout the game. 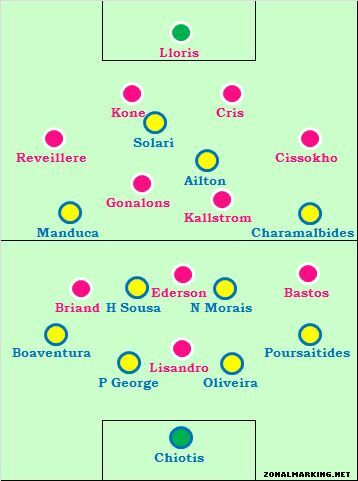 Even when it did look as if the coaches might shake things up, when APOEL coach Ivan Jovanovic switched from two strikers to one striker, and Lyon boss Remi Garde did the opposite at the same time, the sides continued to play in much the same manner. The game had actually started in an exciting fashion, because the home side, in front of a very noisy crowd, needed a goal. They trailed 1-0 from the first leg, and therefore went into the game knowing that if they didn’t score in 90 minutes, they would be eliminated. As a result, they changed their system. This wasn’t the usual counter-attacking 4-2-3-1, and certainly not the defensive 4-1-4-1 they tried in the first leg, but instead featured two strikers for the first time in the competition, with Ailton dropped back behind another forward, Esteban Solari. APOEL therefore took charge of the game – they needed to attack, be in command, and take the game to the opposition. When they pushed men forward, they would leave spaces at the back for Lyon counter-attacks. It might sound simple, but football needs at least one side to attack for there to be goals in a game, and in the second leg when one side often starts the game needing to score to prevent defeat, the games are generally more open than in the first leg. As a result of APOEL’s determination, they made a flying start to the game – they went ahead within ten minutes, through Brazilian winger Manduca. But while this was a fine start to the game, the goal arrived too early as far as the spectacle was concerned. It meant that APOEL now had their goal, and they no longer needed to attack. In fact, their priority was now defence. The tie was evenly-balanced at 1-1, but Lyon now had 80 minutes to get an away goal, which would then leave APOEL having to score twice. Lyon also had the 30 minute extra-time period, where there was the same situation. In short, after scoring after 10 minutes, APOEL now had to face 110 minutes of play where the negative value of a goal conceded significantly outweighed the positive value of a goal scored. Lyon, on the other hand, had arrived to be patient. They didn’t play for a 0-0, but equally a 0-0 would have been an excellent result for them. As a result, their initial line-up was cautious, with Bafetimbi Gomis on the bench. This wasn’t an XI built for goals. When they went behind, they had the opposite situation to APOEL. Logically, they’d be the more attacking side – but then they were away from home, and they’d started the game cautiously, and it’s difficult to break out of the shell. Lyon were slightly more adventurous (hence the opposing nature of the two aforementioned substitutions), but we were basically treated to a 110-minute stand-off, where neither side showed enough determination to score. This is an unintended but problematic aspect of the away goals rule. Ian Hawkey has also written about the problems. The importance of this one game shouldn’t be overstated, but had there not been the away goals rule in play here, APOEL would have felt freer to build on their momentum, continued to attack, and we would have had a much more entertaining match. Bit harsh on APOEL in my opinion, they only started to defend and get men behind the ball in numbers from 70mins onwards, which is understandable as 1 goal would have left them needing 2. Before that however I felt they were playing their usual game, which is fairly defensive anyway but I felt they were making an effort to win the game in normal time and had their chances, for me it was a very interesting game to watch. I like the slant this article. Good notes. Finally I agree with Wenger’s crying. Wenger comments on the laws of the game remarkably often, and generally speaks sense (though his kick-ins suggestion re: Delap was somewhat wide of the mark). I agree with @caniggiascores that it is a bit harsh to say that APOEL was the more negative side. APOEL went for the 2nd goal during the 90mins to avoid the ET due to the superior fitness of the Lyon players. In ET i would agree that APOEL were content for the game to go to penalties. Good point on the away goals issue. I think it was a problem of Lyon not being able to score against an (albeit defensive) weaker team. The right side of their attack was poor. Reveillere rarely got forward to any good effect and played some poor passes and crosses. He was also a weak link defensively and was at fault for the opener. Further forward, Briand rarely touched the ball, he was outnumbered in his zone and was never a threat, arguably he needed support from an overlapping fullback that he rarely got. They did have some good attacking talent at LB, where Cissokho charged forward and combined with Bastos well when attacking down the left flank. I would have liked to have seen Bastos use this better tho to come inside more and let Cissokho stretch the play, as he would have got more space. Maybe Briand would have had a better time on this flank? In CM, Lyon use Kallstrom as their main playmaker, as he had the passing ability to catch APOEL out with quick long balls forward. He and Cissokho were Lyons best players. But Gonalons next him to him was too conservative and could have got forward more to create a surprise factor, as APOEL’s CM’s were not a threat. Ederson playing in the hole was completely crowded out and couldnt get a touch on the ball. He was invisible the whole game and should have been subbed off sooner, at least Gomis gave them something different up front. Speaking of up front, Lisandro wasn’t too bad, dropping into deeper areas and holding up the ball admirably, but no-one was able to exploit the space he created, with Briand and Bastos the main culprits. Maybe Gomis would have been a better option from the start, as he a better threat in the air and offers more pace in behind. Overall, Lyon had some good attacking thrust from LB but Bastos didnt exploit it, had good supply from midfield (Kallstrom) but could.t find space further forward and had good movement from Lisandro up front but could get runners from midfield (Bastos, Briand, Ederson and even Gonalons). They were too conservative and should have got more bodies forward, a missed chance to go further in a competition they have been poor in recently. http://economicinterest.wordpress.com/ my blog, give a read if you are interested. Even if one were to assume the appropriateness of the away goals rule, it is very disturbing to see a 30 min extra time (when teams are tied on aggregate and away goals). That shifts the equilibrium from a “fair competition”. One legged ties followed by extra time and penalties is fair. But if teams are level after 180 mins (aggregate AND away goals), then playing a 30min extra time (with away goals rule applicable there) is redundant. Either the away goals rule shouldn’t be applicable for those 30 mins (but that probably wouldn’t be fair too, because one team would have home advantage), or penalties right after 90 mins. I’m not entirely convinced banning/changing the away goals rule would improve much. It would only lead, one may argue, to more teams parking the bus completely away from home, Inter-at-Nou-Camp style: why would you take the risk of doing otherwise without away goals counting double? Yes, that was an interesting match but mostly because it was so unique; I for one wouldn’t want to see that twice every Wednesday. In my view, the trade-off between a hesitant, perhaps slightly cagey home side (who can hardly sit on their own half for 90 minutes in front of their own fans) and every single away team parking the bus cynically is an easy one to make. And really, how many teams sit back for a 0-0 in a first leg at home? I recall Marseille getting that result against Man Utd a year ago with relative contentment, but it’s not exactly poisoning all of modern football. Also, I may add that in Marseille’s case they were still kicked out, so perhaps the first result wasn’t so great after all. Furthermore, wouldn’t abolishing the away goals rule lead to many more games going to extra-time? If I’m correct, this was the first tie since, interestingly, Arsenal-Roma in 2009 (Wenger gave the mentioned statement after the first match of that tie) to go into extra-time in the Champions League. I can’t imagine anyone really looking forward to those extra 30 minutes in most cases. In fact, it might lead to cagier matches if extra-time becomes more prevalent: if away goals will get you kicked out in 90 minutes, you ought to take more risks than when you have the safety of extra-time to look forward to. In the case of this match, the problem was that Lyon were too poor (like often this CL season) to turn their game plan around to sufficient effect; it’s not too uncommon that teams start defensively but grow more attacking when the situation calls for it. Nicosia on their hand play counter-attacking football in all European matches, it would only be logical to revert back to their usual style after leveling the tie. Anyway, would this match have served as a celebration of the away goals rule had Lyon attacked more effectively, scored and say, had led to a frantic end-to-end thriller that ended 2-1? I couldn’t read the Hawkey piece by the way, so perhaps I’m missing all sorts of great arguments. There’s enough reason to be skeptic however. Postscript: I didn’t see any of the previous comments before writing, so sorry if I repeated anything said earlier. good point. escpecially agree with your first line. i like the away goals rule. its gives these games that extra twist. in that recent excellent article about “control” ZM showed how the great teams can still attack & win while still being solid defensively. I agree. The original rationale for the away goals rule still applies. I’d love for ZM or anyone else to explain why, if away goals were abolished, any team playing at Barcelona or Madrid shouldn’t put 7-10 defenders on the field. Heck, even with the away goals rule, playing conservatively on the road is the standard. Also, ZM didn’t mention how the first leg of APOEL-Lyon was ridiculously one-sided and and how conservative APOEL was even with the away goals rule. If you got rid of the away goals rule, you’d end up with more matches like that. Ian Hawkey Link is directing to “Issue Zero Digital Download” ..u just mistakenly put the link or did i miss something here ??? Proposed new Euro rule: If the first leg is 0 – 0 at half time, each team must withdraw one player for the second half (and so play ten vs ten). If a first leg ends 0 – 0, the second leg will start ten vs ten with, again, a potential player withdrawal at half time. If extra time is to be played, each side must first withdraw one player. That’ll throw up a few more goals, eh? Totally agree with you, ZM. Thanks for pointing that out. When last year Madrid was playing Barca, a large fraction of the press complained about Mourinho being so cautious and defensive in their home match. He was simply trying to avoid away-goals for Barca. I’d like to see statistics on which team advances after a 0-0 first leg. Is 0-0 really that beneficial to the home side in the first leg? In the English league the home side scores 1.66 goals per game, to 1.19 for the away side. Traveling across the continent to a stadium packed with rabid fans can’t be any easier on the away side. Compare that advantage to the relatively small percentage of games that are decided by the away goals rule and it seems like you’d want to take full advantage of your edge at home rather than shut the game down. Shutting down games in your own stadium seems like a move more out of fear than out of sound strategy.. but I’d love to see some numbers to test that hypothesis. I put together a graph on this once, used Europa League/UEFA Cup and Champions League knockout round results from 2000-01 campaign to the present. After a 0-0 tie in the first leg, the home team in the first leg advances 30.2% of the time (13 of 43). This is the first time I really disagree with Zonal Marking. I wish to make 3 points. 1)Football is a zero-sum game so its logically imposible for both teams to benefit from cautious play, in this game clearly one team made a mistake because its logically impossible for both team to be making the correct strategy of playing carefully. The problem only arrives when both manager( one of them incorrectly) think their team benefits more by playing cautiously. Given that a 2-1 score in favor of Apoel meant Lyon went through, maybe the french side was the team that made the strategic mistake and they should have pushed on, but there is no way Apoel and Lyon BOTH made the right desition. What could be possible is that many times the situation calls for the away team to be the one with initiative and because away teams usually have a more cautious setup they end up failing to adapt. 2) As there is less time in the clock the home goal becomes more and more valuable, if Apoel score with 40 minutes remaining the Lyon have full 40 minutes to draw so in that case an away goal is more valuable than a home one but if Apoel score with 1 minute remaining then the home goal is worth almost the same as an away goal. However there is the possibility that if there are like 85 minutes left then an away goal isnt as valuable compared to the home goal as if there are only 40 minutes because there is so much time on the game left that the home team will be able to use their home advantage to their favor and recover. 3) I think the champions league should scrap away goals altogether and have a seeding process like the one Copa Libertadores because that way we avoid a team having the advantage of playing extra time at home just because they got a lucky draw. To your point 1): If for either team “risking more” (changing style of play) would mean an higher chance of scoring, but an even higher chance of conceding a goal (e.g. if they have bad offensive players who are anyhow unlikely to score, but a good defensive setup otherwise) then for both teams playing carefully is the correct approach. Rather keep the balance (and the 50:50 chance in penalties) and wait for random mistakes of the other team. Of course that applies in particular to a single-match knockout. For the apoel-lyon case yesterday, actually lyon could and should have risked more. Since scoring once would have forced apoel to score two in return. But for the late stage of the game your point 2) started to apply then. In that case it has nothing to do with away goals. The point is that the away goals cant provide a scenario where it is correct for BOTH teams play even more cautiously than they would do under normal circustances without away goals. Of course the counterargument is that Lyon had planned for a more cautious aproach given they had a 1-0 lead but there is something called substitutions you know. I think the correct title should be an example of Apoel playing correctly cautiously at home because of away goals and Lyon failing to take advantage of the rule. I have to agree with the suggestion that Lyon’s tactics were ill-conceived in this game. The away-goal rule really should encourage the away team to attack more, b/c one goal effectively ensures advancement. Can you take a look at ManU vs Bilbao tonight and see if it’s worthy of a write up? Bielsa vs SAF is very interesting. I’m a ManU fan, didn’t look forward in advance to this match up, but after reading the live blogs at the Guardian and Soccernet, I actually look forward to watching watching it off the DVR tonight. It reads like a brilliant game, especially on Bilbao’s part. I can’t say I’ve watched Lyon play since last year’s CL…….but where the (heck) is Gourcuff? He doesn’t even make the bench these days? I’ve read some pretty bad stuff about him struggling and problems fitting into the squad (same as always), but how can he have fallen so far one year after being such an expensive addition? Completely agree with wenger that the away goal rule must be scrapped. it is the stupidest and most unfair rule in football. it shouldn’t matter if teams attack more or less, the most important thing is to have a fair rule. why should a team go through when they have tied 0-0 at home and 1-1 away? even if it affected the entertainment of the match, which i think it does not, it should still be scrapped. this is football, if you want to excitement go see clowns or something. just got turned onto this site and man do i love it. as for the away goal discussion, i’m all in favor of the away goal rule. it gives “smaller” teams such as apoel a chance to compete and have a chance vs bigger teams. To be honest, Lyon (despite not having the best season domestically) should have done more at home vs a weaker APOEL team. apoel did enough in regulation and overtime to force it to the crapshoot that is pk’s. i think it’s great for the game and at least minimizes the chance (by a little) to always see the same last 4-8 teams in this competition. The away goal advantage is a rule that has been going on for so long and therefore seems so much taken as read that it is very seldom discussed and I’m glad to see it adressed here. It always leads to interesting debates when topics that are taken for granted are brought up. But for the example taken (Apoel vs OL), I don’t think it would have changed anything. In my opinion, Apoel considered themselves as the underdog (which was true, even if only in theory considering that they’re the ones who qualified at the end), as they were lacking tactical, technical and athletic skills compared to their opponent, not mentionning european experience. So I guess they would have closed the game anyway once they scored their goal : once it was a tie 1-1 on both games (whether with the away goal advantage or not), their best bet was to play their natural style in CL which relies a lot on heavy defence and hope to get a scoring counter-attack, and if not possible, to make it to the penalty kicks. On the other hand, for Lyon, once Nicosie had the lead, they had 80 minutes in regular time (plus the 30 of extra-time) to score a goal and they definitely tried but could not achieve to do it due to very poor playmaking (and it’s sad for me to admit it as I’m supporting this team). Just for information, here is a link (in french) on qualification results based on the score after first game : http://www.poteau-rentrant.com/index.php?post/2009/04/29/Tous-les-pourcentages-de-qualification-en-coupe-d-Europe. It shows that with the away goal advantage rule, if winning 1-0 gives you better chance to qualify than a 2-1 victory, it is always beter than a 0-0. As a few people have said, I think ZM is wrong on this one. I think the situation of both sides playing negatively is very much the exception rather than the rule. Even in this game it can fairly be said that Lyon’s failutre to attack once they’d conceeded was more to do with their own tactical shortcomings than them feeling incentivised to hold on to what they had. I would also agree that 0-0 isn’t seen as a positive result in the first leg for the home team. That is to say; the home team still looks to take the initiative and win the majority of first legs. If Wenger’s right that wouldn’t be the case, we would instead see home teams on the back foot in the first leg. That is very seldom the case. I’m sure there are examples of this, but it’s far from normal. I know it’s something of a cliche used by pundits, but the sentence; ‘They’ll want to take a lead over to (insert venue of away leg)’ is commonly used and I believe holds true. Teams do look to finish their home leg with an advantage. It’s certainly seen as problematic if a team has to go away from home without a lead. Alongsie that, though, is the belief that an away goal from the first leg is very important to your chances. After Arsenal’s 4-0 defeat in Milan we heard many pundits say that, rather than the fact that they’d conceeded so many, it was their lack of an away goal that made progression almost impossible. They perhaps could score 4 back in London, but there was little prospect of that happening without them conceeding, and without an away goal that would become insurmountable. And that’s how the tie played out; Milan didn’t score an away goal, but they were encouraged to come forward by that prospect in a tie where they otherwise may have parked the bus entirely. The away goals rule prevents European competiton producing freakish games of football that in no way resemble what one would normally expect. Without them it would likely be a case of; you have a go at us for 90 minutes then we’ll have a go at you for 90 minutes. Instead of two legs of Chelsea vs Napoli you’d have; Napoli’s attack vs Chelsea’s defence, then Chelsea’s attack vs Napoli’s defence. And in the end you may well not know who actually has the better team were both sides to play their normal game. We now have a situation where both sides feel obliged to win their home game and score away from home. So every game in the knock-out phase sees both teams feel that they must score. That’s perfect.